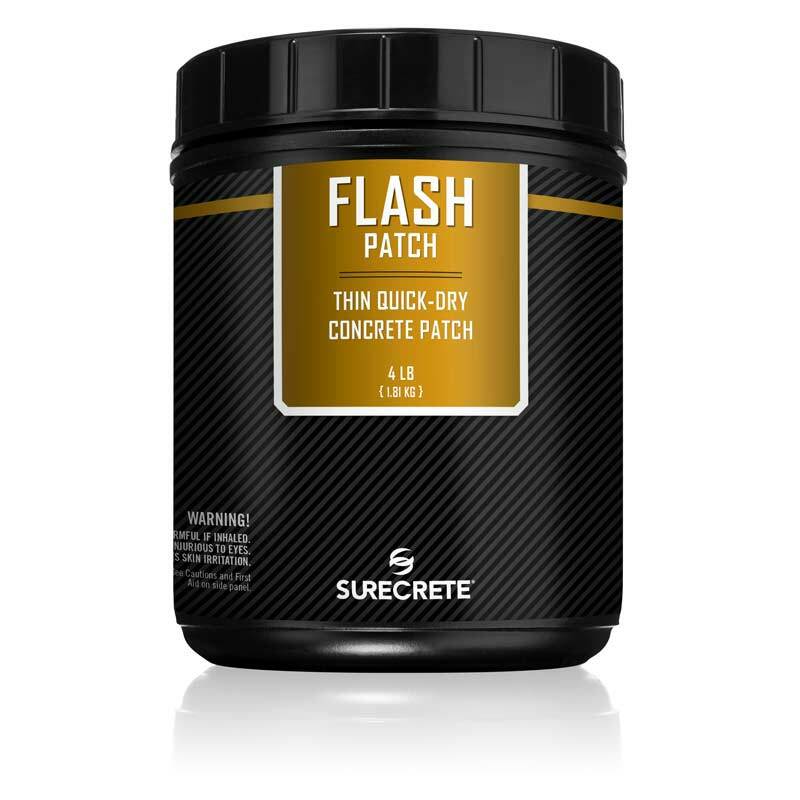 With SureCrete’s thin concrete repair patching product, FlashPatch, repairing and fixing your partially broken concrete slab may not be the most glorious part of creating a beautiful new cement surface. FlashPatch™ it is certainly one of the most important steps in a successful decorative or restorative concrete project. This product can help to ensure that whatever coating or overlay on top of your repaired slab will stay strong and continue to look fantastic for years to come. While most cement patching products requiring bonding agents and need to be left overnight to cure before coating or overlay can be applied. 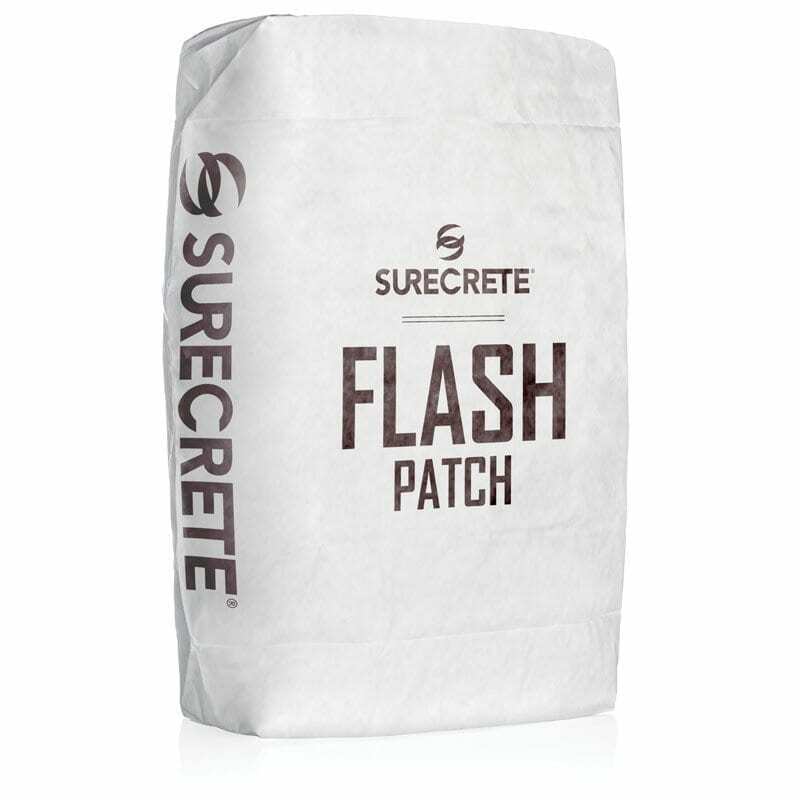 SureCrete’s Flash Patch bag mix can be implemented to receive a finish coat in a little as 1 hour, unlike quikrete. Shortening this process can help whether you’re just a weekend warrior trying to get your cracked concrete done quickly, or you’re a professional artisan contractor on a commercial project seeking to make sure your clients can utilize their new flooring systems as soon as possible. Flash Patch™ is as easy as mix concrete in a bucket. Flash Patch™ offers superior bonding power without additional bonding agents, able to patch low spots, divots, and spalls in concrete floors. Flash Patch™ is designed for heavy traffic repairs, as it has the resilience to patch commercial loading docks, parking lots, walkways, entryways, and parking garages. How Do You Apply SureCrete Quick Concrete Patching Material? We tried to make it as straightforward and efficient as possible when utilizing our concrete repair mix and overlay materials, and repair is certainly no different. Cleaning is always your priority in any concrete project. Make sure the surface is clear of all chemical contaminants, grease, oil, old paint and other foreign matter. It may not always be needed, but your surface may require some profiling to ensure the most secure bond of Flash Patch to your substrate. Dampen the area slightly without creating any puddles or pooling areas. NOTE: Before applying Flash Patch™, the surface should be saturated surface dry (SSD) or damp with no puddles. Mix only enough product for your current project in a bucket, making sure it has a smooth consistency. Trowel by hand or squeegee product tightly into patched area, as quickly as is reasonable. Minimize troweling, do not over work surface. Allow product to dry sufficiently before placement of any overlay, usually 1-2 hours (depending on surface porosity, temperature, and the amount of material used). Before applying an overlay, be certain that the patched surface is no longer generating excessive heat from its curing. If using a coating or sealer, wait 24 hours. Question: Can I create a feather edge? Answer: Yes! You most certainly can. Question: Do I need a bonding agent? Answer: No. our mix is a single component bag mix. Just add water it is a self bonding concrete product. Question: Is SureCrete Concrete Hole Repair Mix a single component bag mix. Just add water! Answer: Yes, it’s for very fast curing just add water. One hour is all you need to wait before applying another coating or overlay. (24 Hours is recommended) If you have use quikrete concrete repair before, you will love Surecrete’s product easy of use. Question: What colors is the repair mix available? Answer: Flash Patch™ is a white-cement-based product. However, it may be colored using our Color Packs system. However, since the cement content varies from our overlay products, the same colors may be more opaque than what on our color chart. Question: How thick can I apply patching concrete mix? Answer: 1″ is the thickest we suggest in a single pass. It only for shallow concrete patching. Utilize another product, such as Deep Level, for larger void filling. 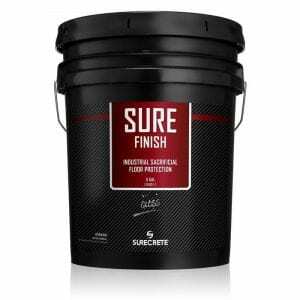 Question: It’s freezing out, can I still use SureCrete’s repair product? Answer: The suggested temperature range for this product is between 40 and 85 degrees Fahrenheit. Any more or less than this and the product will not cure correctly. Coverage 50 lbs = 0.45 cubic feet, or 12 square feet at 1/2” depth. Answer: Yes! You most certainly can! Answer: No. our mix is a single component bag mix. Just add water! Question: Is Surecrete Repair Mixa single component bag mix. Just add water! Answer: Yes, it was specifically designed for very fast curing. One hour is all you need to wait before applying another coating or overlay. 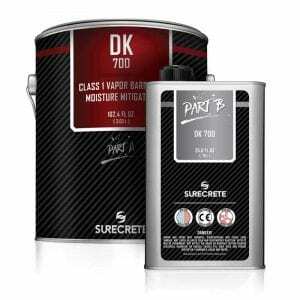 If you have used quikrete® concrete repair before, you will love Surecrete’s product easy of use. Question: What colors is the repair mix available in? Answer: Flash Patch is only sold as a white-cement-based product, however it may be colored using our Color Packs system. However, since the cement content varies from our overlay products, the same colors may be more opaque than what is seen on our color chart. Answer: 1″ is the thickest we suggest in a single pass. It is only meant for shallow concrete patching. Utilize another product, such as Deep Level, for larger void filling. 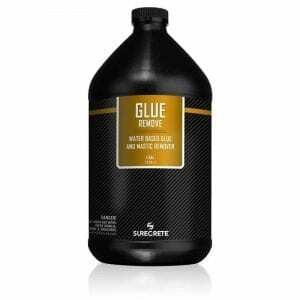 Question: It’s really cold out, can I still use Surecrete’s repair product? Your test says it is available in white Portland cement color. Is it also available in concrete gray?